Before Grayson was born, a routine scan discovered an abnormality. Specialists were called in and further testing revealed that he would be born with myelomeningocele Spina Bifida, the most serious form of Spina Bifida and severe hydrocephalus. This means the bones in his back did not properly form during pregnancy leaving an opening and the spinal cord exposed. The months before his birth were filled with tears but his parents knew that they would be blessed with an extra special little boy. When Grayson was born he was quickly whisked away to the Neonatal Intensive Care Unit where he spent the first 17 days of his life. He had his first surgery when he was just 15 hours old as doctors needed to close the spine. 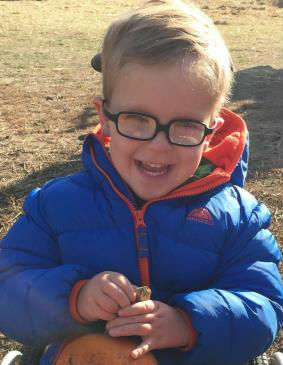 Grayson has endured four brain surgeries since he was born. Doctors needed to place a shunt to relieve the fluid around his brain and theses often need to be replaced. His first brain surgery was at just 11 days old, a second when he was just a year old and another when he was just two years old. Unfortunately, his life will be filled with these types of surgeries. He will also need surgeries on his tendons and feet no later than this spring. Grayson’s life is filled with weekly intensive therapy sessions and continual doctor appointments. He has had to endure more in his young life than most will ever have to and he struggles to do things most people take for granted. He has experienced a great deal of disappointment as being in a wheelchair has some big disadvantages for getting everywhere he wants...gravel, bark, trails, etc. Many places are not wheelchair friendly and- he just wants to enjoy the simple things in life like everyone else. Despite everything, Grayson has a positive attitude and he never complains. He is a very happy, go lucky, sweet soul that loves to do things himself! He loves to be around people and chat with whoever will listen. Grayson is the first to be at your side if you get hurt or need a hug and he loves to pass out hugs and kisses to all. Simply put, he is inspirational to everyone he meets! Grayson lights up a room and has changed so many people’s lives for the better. He loves buses, play dough, drawing and playing outside with his siblings.. He will be adopted as a Sparrow to Beaumont Middle School. Students will work hard to teach others compassion and raise money for Grayson through sponsored community service and fundraising.